PILI, Camarines Sur— Six days after the Commission on Elections (COMELEC) proclaimed Board Member Gabriel Ariel Abonal, the poll body has ordered another candidate to be sworn in as the newest member of the Sangguniang Panlalawigan of Camarines Sur. This is after the Commission en banc issued a writ of execution to enforce the Resolution of the Comelec Second Division, which nullified the Certificate of Candidacy of Angel G. Naval for being violative of the three-term limit rule. 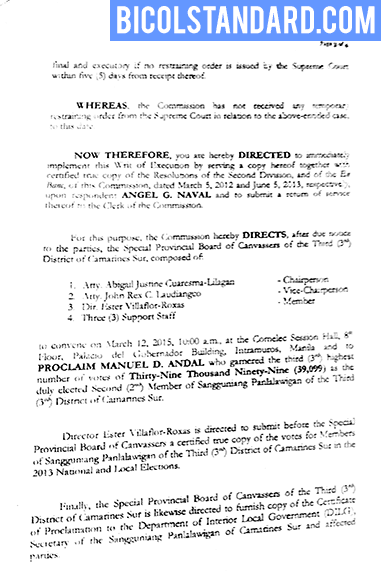 In a 4-page writ issued on Feb. 26, 2015, the Comelec en banc directed the Special Provincial Board of Canvassers to proclaim Manuel G. Andal as the duly-elected Second (2nd) Member of the Sangguniang Panlalawigan of the Third District of Camarines Sur. 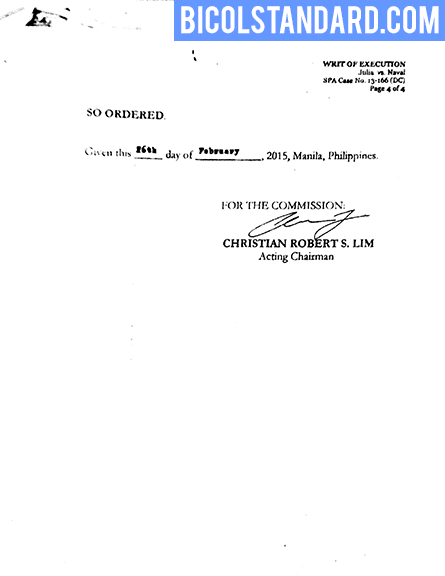 Signed by Acting Comelec Chairman Christian Robert S. Lim, the Constitutional body mandated the Board of Canvassers to convene on March 12 (Thursday), 10:00 am at the Comelec Session Hall in Manila for the proclamation. 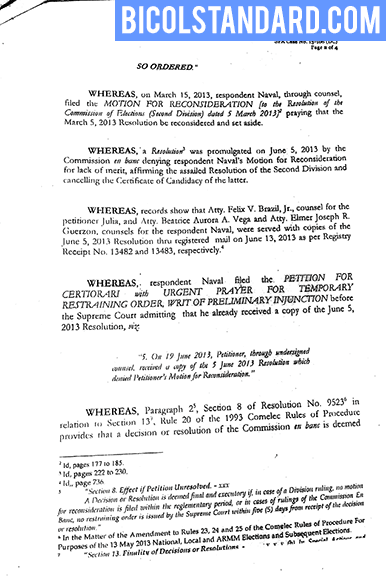 The March 5, 2012 Comelec resolution stemmed from the case filed by Nelson B. Julia against Angel G. Naval, which was docketed as SPA Case No. 13-166 (DC). Said Comelec decision was later assailed before the Supreme Court on certiorari. 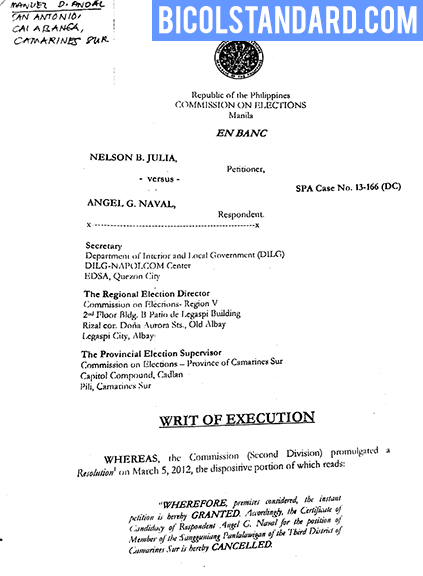 The High Court sustained the Comelec and ruled in favor of the cancelation of Naval’s COC. In a 25-page decision promulgated on July 8, 2014, the Supreme Court emphasized: “The drafters of the Constitution recognized the propensity of public officers to perpetuate themselves in power, hence, the adoption of term limits and a guarantee of every citizen's equal access to public service. These are the restrictions statesmen should observe for they are intended to help ensure the continued vitality of our republican institutions." Consequently, with Naval’s disqualification, Comelec declared Andal, who garnered the next highest number of votes, the duly-elected candidate. Andal obtained thirty-nine thousand ninety-nine (39,099) votes, the third highest among the candidates during the 2013 polls. Meanwhile, Julia got the most number of votes. Vice Governor Fortunato Pena announced during Tuesday’s regular session of the Sangguniang Panlalawigan that Naval had already tendered his resignation. Pena said that Naval submitted his resignation letter on February 27, 2015. The application was granted on same date. In a related development, Sangguniang Panlalawigan has continued to snub newly proclaimed Board Member Gabriel Ariel Abonal. This is notwithstanding the acknowledgment of its receipt of the copy of the writ of execution issued by the Comelec en banc. The legislative council has ignored the plea of the Board Member to participate in today’s session, as its member. Instead, the Vice Governor has referred the copy of the decision to one of the council’s committees. Pena said it would be wise to defer Abonal’s recognition as its member pending the Supreme Court’s resolution of the Petition for Certiorari with Prayer for the issuance of a Temporary Restraining Order filed by ousted Board Member Romulo Hernandez. Abonal was proclaimed and sworn into office on February 20.—--BICOLSTANDARD.COM Pirming enot. Pirming bago.